(See Pictures Where The Lion Roared). He was born in Kashmir and spent his early days there living joyfully. Then, a day came when he denounced world and became an ascetic. Soon after, he moved to Punjab. He spent his time in various places in India, like Haridwar, Haripur and Burhanpur etc. During different times, he became disciple of Janaki Das and Mahatma Ramdas. It was like a turning point in his life when well-known Yogi Augharhnath accepted him his disciple. As a chosen disciple of Yogi Augharhnath, he became an expert of Tantra Vidya. He was considered a person having many magical powers. As if his search was not over, he advanced towards the South. At Burhanpur, he became disciple of famous ‘Siddh’, named ‘Looneeya’. He then reached the old city of Nanded in present Maharashtra state of India and founded his monastery here on bank of river Godavari. Until now, he had established himself as a great Tantric Yogi. He was now famous as Madho Das Bairagi. Madho Das Bairagi. As if some emptiness deep inside him was disturbing him, he was still searching for a Guru, a true Guru. As fortune was with him this time, he did not necessitate going anywhere to discover the true Guru. The true Guru himself was to come to him. On the day of Sun eclipse, when Swami Madho Das Bairagi returned to his monastery, he saw a person looking like a King sitting on his (Madho’s) bed. It did not take too much time for him to realize that the person was not a King, but the King of Kings. The King of Kings, the treasurer of the God Almighty, the true Guru was there to bless Madho Das Bairagi. After their historic conversation, the true Guru decided to accept Madho Das his disciple. Madho Das Bairagi’s search for true Guru was now completed very fruitfully. The next day, the true Guru initiated Madho Das by ‘Khande Kee Pahul’. Madho Das was now ‘Banda’ (slave) of the true Guru. If truth be told, Madho Das had now died. He was reborn as ‘Banda Singh’. The true Guru gave him the title of ‘Bahadur’ (brave). He was going to be remembered as ‘Baba Banda Singh Bahadur’. He, Baba Banda Singh the brave, captured fort of Mukhlisgarh, situated in the lower Shiwalik Hills. The fort stood atop a hill top. Baba Banda Singh, the brave got Mukhlisgarh fort repaired and renamed it as Lohgarh, the Fort of Iron. The history considers this Lohgarh the Capital of first Khalsa State. The entire treasury acquired in his expeditions was deposited here in Lohgarh Sahib. The coins in the name of Guru Nanak and Guru Gobind Singh were minted and issued from here. As a ruler, the lion roared here. Roar of the lion was a warning to tyrants. Roar of the lion was a message that a ‘Singh’ of ‘Nirbhau’ (fearless) Guru is always ‘Nirbhau’. He was free from fear of death. After tasting the ‘Amrit’ (nectar), he had become an immortal. Till today, history sings the glorious deeds of Baba Banda Singh the brave. He punished Usman Khan. He punished Wazir Khan. He established the Khalsa Raj. How is Lohgarh now? Does it still exist? Is there any monument built in memory of Baba Banda Singh the brave? Do Sikhs who raise slogans of ‘Raj Karega Khalsa’ (Khalsa shall rule) often visit this place to pay respect for those who established the Khalsa Rule in reality? 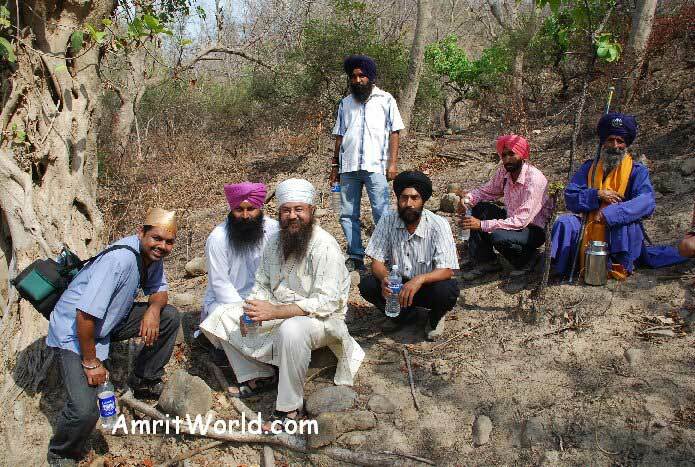 To kiss the land where the lion roared, I started my journey with Gurpreet Singh ‘Malhi’, Yadwinder Singh and Sarjit Singh (all Team Amrit World members) in Gurpreet Singh’s car. We crossed the historic city of Kapalmochan and advanced towards lower Shiwalik hills. I was thinking why Baba Banda Singh the brave chose this place for his capital. It is a backward area. As we left the main road, I was expecting a broken small road going through villages. I was mistaken here. Actually, there was no road. We found ourselves in a river bed. Water rarely flows through this seasonal river, that too during rainy days. It was a different experience. We were traveling through a river. No road, no population, no sign of any development. What was Baba Banda Singh the brave was doing here? I was now more anxious. After a few moments, I asked Gurpreet Singh to stop the car. We came out. It was absolutely calm place. No population at all. I realised that it was perfectly a suitable place for Baba Banda Singh Bahadur. He must have known that the number of his actual soldiers was very small. He must have thought to establish his capital away from the then royal highway. Lohgarh was not only away from highway, but it was difficult to attack it as well. As we know the character of Baba Banda Singh the brave, he did not want to create troubles for civilians. If an army attacks Lohgarh Sahib, there would be almost no trouble for civilians because this area was not densely populated. We were roughly one kilometer away from Lohgarh Sahib. We again started our journey to Lohgarh Sahib in the car. I raised the slogan of ‘Bole So Nihal’ the instant we reached Gurdwara Quila Lohgarh Sahib of Baba Banda Singh Bahadur Ji. Gurpreet Singh Malhi, Yadwinder Singh and Sarjit Singh replied in ‘Sat Sri Akal’. Gurdwara Sahib is under management of Nihangs of Budhha Dal. Two Nihangs were there in Gurdwara Sahib. They were so happy to see us. As I came out of our vehicle, I just kept watching these Nihangs. They are here. They are here to look after a Gurdwara Sahib which is built in memory of our great warrior Baba Banda Singh the brave. We are thankless. We earlier never thought to pay a visit to the very place where the coin was issued in the name of my Guru. We are thankless. We are thankless that we have forgotten him who took revenge of martyrdom of Guru Teg Bahadur Sahib, Mother Gujri Ji, Sahibzada Zorawar Singh Ji and Sahibzada Fateh Singh Ji. We daily shout ‘Raj Karega Khalsa’, but never remembered him who actually established the Khalsa Raj. These Nihangs are great. They have kept the memory of Baba Banda Singh Bahadur alive. We are thankless. What have we brought to present to these Nihangs? Nothing. I was feeling at fault. We entered Gurdwara Sahib. After performing prayer, I read out the ‘Hukamnama’ of Sri Guru Granth Sahib Ji. Then, we sat silently in front of our Guru, Sri Guru Granth Sahib Ji Maharaj. I was not the only one who was feeling guilty. Gurpreet Singh Malhi was having the same feeling. I saw him. He was sitting silently. I asked him, “What have we brought for these Nihangs?” In point of fact, I was saying that we are thankless. He remained silent for a few moments. Then he said, “We will come back very soon”. We decided to come back as early as possible. I suggested to present new dresses for these Nihangs. Gurpreet Singh was agreed to my idea. One of these Nihangs took the job to show us important points of Fort Lohgarh Sahib. First we visited the historic ‘Kool’. This ‘kool’ was one of sources of water for Lohgarh. Then, we started climbing hills. 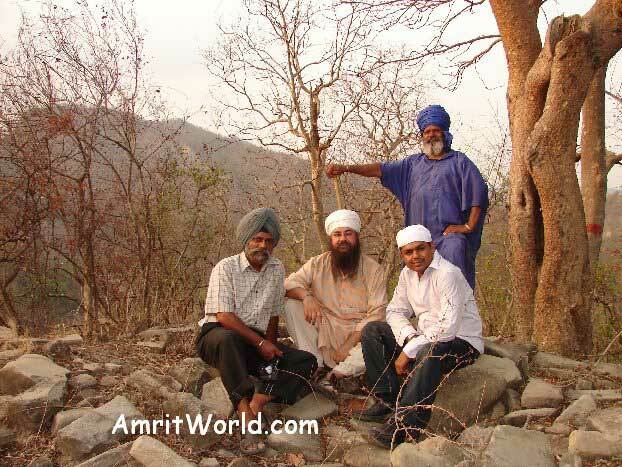 The historic fort of Baba Banda Singh Bahadur was stood atop a hill top. 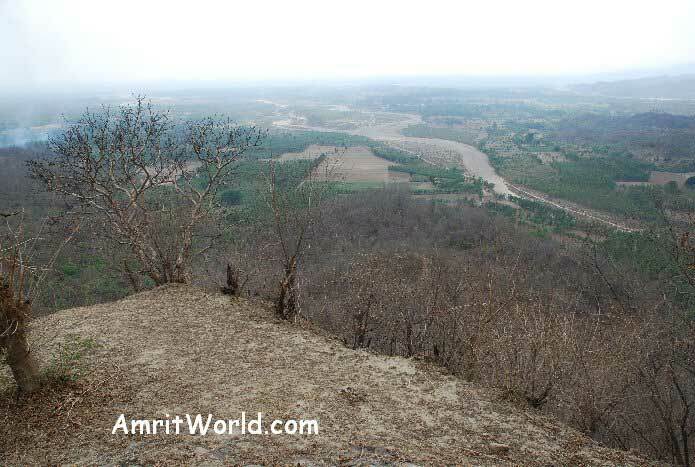 While climbing the hill, it seemed there would be no sign of old fort of Lohgarh Sahib. However, when we reached the hill top, the ruins of historic fort of Lohgarh of Baba Banda Singh Bahadur were clearly visible. As soon as I saw two Nishan Sahiban (One is saffron and other blue) on this hill top, I raised slogan in delight, “Bole So Nihaaaaaaal”. Everyone replied, “Sat Sri Akaaaaaal”. Yes, we had reached the historic fort of Lohgarh Sahib of Baba Banda Singh the brave. Presently, one can find four watch towers of old fort. These watch towers are situated on different hill tops. ‘Nishan Sahiban’ (Khalsa flags) are there on every watch tower. We were on first tower which was situated on a lower hill. Well, he, the lion once lived here in this fort. He must have visited these watch towers for many times. Slowly, we advanced towards a historic trench on this watch tower. As soon as we saw the trench, we automatically started raising slogans, “Raaj Karega Khalsa” (Khalsa Shall Rule). Stones are still there. No one moved them until now. From here, one can keep watch on every person coming towards Lohgarh Sahib from plains. This was an ideal place for watch keepers and soldiers. I sat in this trench and felt delighted. Many Khalsa warriors sat here during the rule of Baba Banda Singh Bahadur Ji. Mogul King Bahadur Shah sent his army to besiege the fort of Lohgarh Sahib. 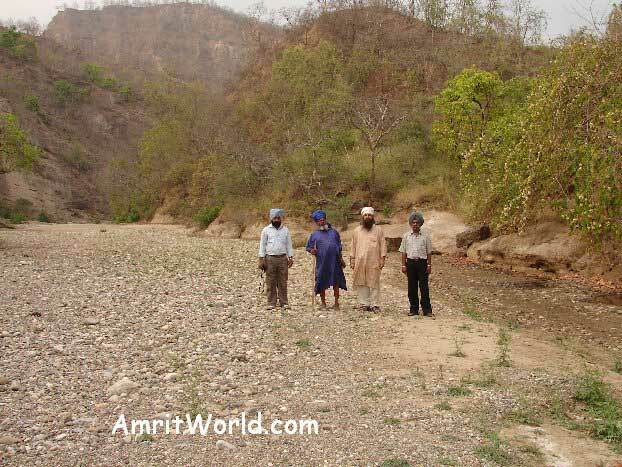 Khalsa army men fought here for one month under Baba Banda Singh the brave. At last they disappeared towards upper hills of Nahan. Mogul army could not find them. Sun saluted Lohgarh and moved towards other side of the globe. We came back to Gurdwara Sahib. After taking some rest, we came back to our homes. After a few days, we again went to Lohgarh Sahib. This time, Gupreet Singh Malhi, Gurpeet Singh Raju, Harpreet Singh, Jatinder Singh JD, Rachhpal Singh and Bhupinder Singh Monu joined me. First, we visited Gurdwara Quila Lohgarh Sahib. Head Granthi Singh of the Gurdwara Sahib performed prayer for us. Then, I read out the holy ‘Hukamnama’ of Sri Guru Granth Sahib Ji Maharaj. We then presented dresses to Nihangs who are serving this Gurdwara Sahib. During this visit, we climbed another hill-top where another watch tower of old fort of Lohgarh Sahib was situated. This hill-top is higher than the first one. Two Nishan Sahiban (Sikh flags) on top of this hill remind us Baba Banda Singh Bahadur and other Sikh warriors, who used to stay here in this fort. When Sun had a last look on Lohgarh Sahib on that day, we left for our homes. However, every one of us wants to come again to Lohgarh Sahib of Baba Banda Singh Bahadur Ji. (The historic fort of Lohgarh Sahib of Baba Banda Singh Bahadur Ji is approximately 14-15 Kilometers from historic city of Kapalmochan in Distt. of Yamunanagar, Haryana. Route from Yamunanagar: Yamunanagar ==> Bilaspur ==> Kapalmochan ==> Lohgarh Sahib. If someone is coming from Chandigarh, he must follow this route: Chandigarh ==> Raipur Rani ==> Sadhaura ==> Bilaspur ==> Kapalmochan ==> Lohgarh Sahib. Fort of Lohgarh falls in two states, Haryana and Himachal Pradesh. Gurdwara Quila Lohgarh Sahib is situated in Haryana state, however a big part of old fort is in Himachal Pradesh. There are no shops around Lohgarh Sahib. It is good to carry water with you, as there is shortage of water there, especially during hot months. Also, water available there is salty. People often take water from Lohgarh Sahib as ‘Prashad’). (See Pictures of Quila Lohgarh Sahib Where The Lion Roared). This entry was posted in English Articles and tagged Gurdwara on October 26, 2008 by admin. My God ! is this our first ‘Khalsa-Capital’, I just can’t believe. How can I thanks to you my brothers, you people present such a great picture that immediately I decided to go there. While reading, the emotionally-wetted article I felt that you must have many things to say. I request you to share your entire feelings-with-knowledge to us, so that we can know more about OUR OWN REAL HERO. Thanks once again for awakening us, who just raise the slogans of Khalsa Raj. Please keep writing on THE LION, we love to hear his roaring.